As sociologists from around the country (and even the world!) head to Denver, here are a few things to keep you entertained: First, a post about making ASA better by using Twitter and other forms of digital communication (I think I joined Twitter once. I might have to dig out my account in preparation for the conference). 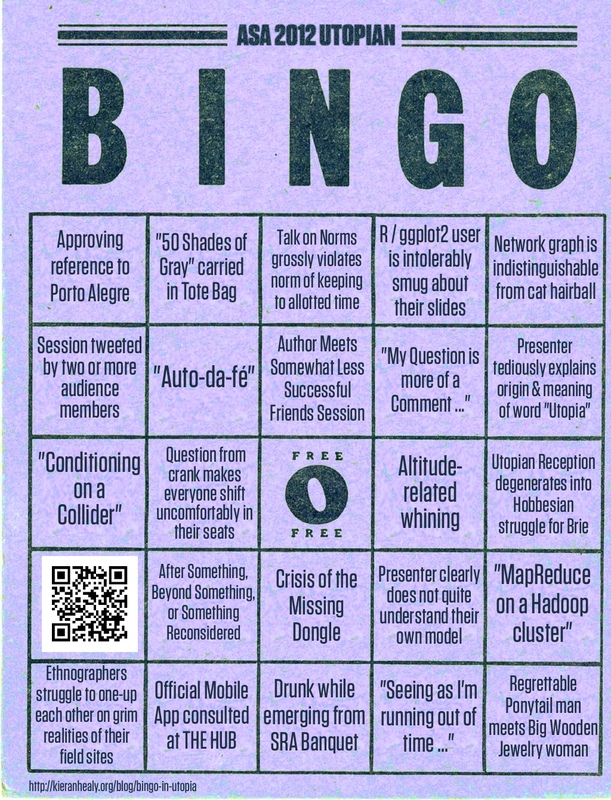 Second, Kieran takes this year’s bingo card to the next level, complete with a “mobile app” version. Finally, and most importantly (and perplexingly), instructions on how to use ASA’s preliminary online program to put your conference schedule into your Outlook and/or Google calendars. The perplexing part is that although you cannot see locations anywhere on your schedule when using the ASA’s website, they’re there when you open the calendar on your computer or mobile device. If these locations are correct, why is the ASA hiding them from us when we use their preliminary program? If they are not correct, I’m going to be awfully disappointed when I get to Denver! Enjoy your flights and don’t forget that the scavenger hunt begins tomorrow morning!